Save your work and close all your programs. At this point, things are different between Windows Vista and Windows XP. If you use Vista, go to Step 3; for XP, go to Step 4. In Windows Vista, click the triangle next to the Padlock icon and choose Restart from the pop-up menu. 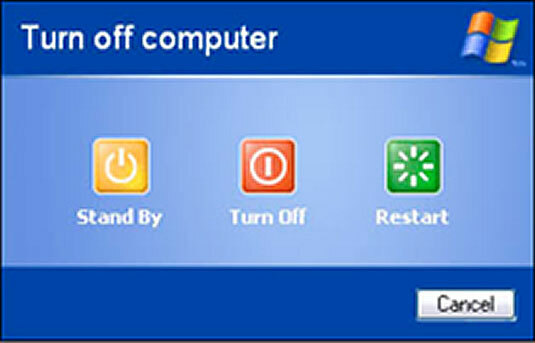 In Windows XP, click the Turn Off Computer button, and then click the Restart button in the Turn Off Computer window. The laptop seems to be turning itself off, but just before it does, it starts right back up again. Amazing. Sometimes, restarting Windows is automatic, such as when installing some software, some hardware helpers called device drivers, and when performing Windows Updates. You’re generally given a choice: “Would you like to restart Windows now?” If so, click the Yes button, and things happen automatically. When the process stalls, such as when you have an open and (gasp!) unsaved document, you have to interrupt things, take care of business, and then manually restart Windows according to the preceding steps.